From 1 March 2019, we are expanding on changes introduced in 2018 that reward associates for driving targeted traffic to selected categories of products. Please find below a set of Frequently Asked Questions that we created to help you understand the changes that we’ve made. 1. Am I going to earn more with these changes? Yes, you could. 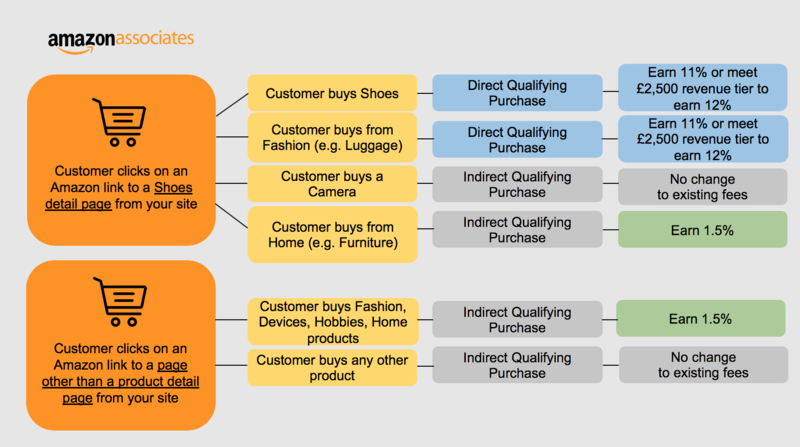 If you focus on driving targeted traffic to product detail pages in specific product categories on Amazon, as opposed to driving untargeted traffic to places such as Amazon’s homepage or category homepages, you will be able to earn more if your traffic converts to sales in specific product categories. 2. How much more can I earn? We have increased fees in several product categories and have created incentives, through revenue tiers, that could allow you to earn more than double what you have been earning in some product categories. Exactly how much more depends on many factors including the types of products that your site links to. For more details on fees and revenue tiers, please see our Associates Program Fee Statement. 3. How can I earn more? You can earn more by creating product-specific content for your readers that results in purchases of those products, or related products, in certain product categories. Please see the table below for applicable product categories. 4. Can I earn less? Yes, you could. If you aren’t linking directly to product detail pages on Amazon (for example, if you link to the Amazon homepage, or pages other than product landing pages), or if a lot of your fees come from customer purchases that aren’t related to the products that you are linking to. 5. So are you trying to save money? Actually, we want to spend more money on our Associates program and associates, but we want to do so in ways that reward associates who focus on driving high-quality, targeted, product-specific content. This is why we’ve increased fees in some product categories for purchases resulting from links to those, or related, categories, even if you don’t generate high volumes of revenues. 6. Can you give me examples of how this all works? Sure! Below are a few scenarios that describe how the changes may, or may not affect you. Scenario 1: Let’s say that you are a fashion-focused publisher who doesn’t generate a lot of sales on Amazon, but the vast majority of your earnings result from purchases in product categories related to fashion. If you do nothing, you will likely earn more since we have increased fees for fashion-related categories from 10% to 11% (where your affiliate links to fashion products results in a purchase in the fashion category). Scenario 2: Let’s consider the same scenario as above, but you do generate lots of sales. 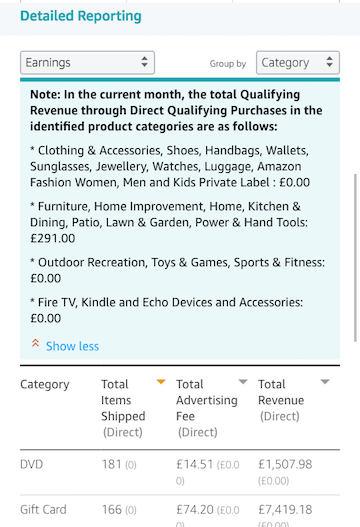 In this case, if the total qualifying revenue that you generate in fashion is equal to or greater than £2,500 in a calendar month, you could earn 12% on all of the fashion sales that result from your content (where your affiliate links to a fashion products result in a purchase in the fashion category). Scenario 3: Now let’s say that you send most of your clicks to pages (*) other than product detail pages, for example you send most of your traffic to Amazon’s homepage. In this scenario, if you don’t change your linking strategy (and potentially your content strategy too), you would likely see your earnings decrease as you would receive fees of 1.5%, in certain product categories. Below are a couple of illustrations to try to help you better understand how the new rate structure works. 7. What about sales referred to other Amazon sites? Are they affected? These changes apply to purchases referred to Amazon.co.uk, Amazon.fr, Amazon.it, Amazon.es and Amazon.de. 8. 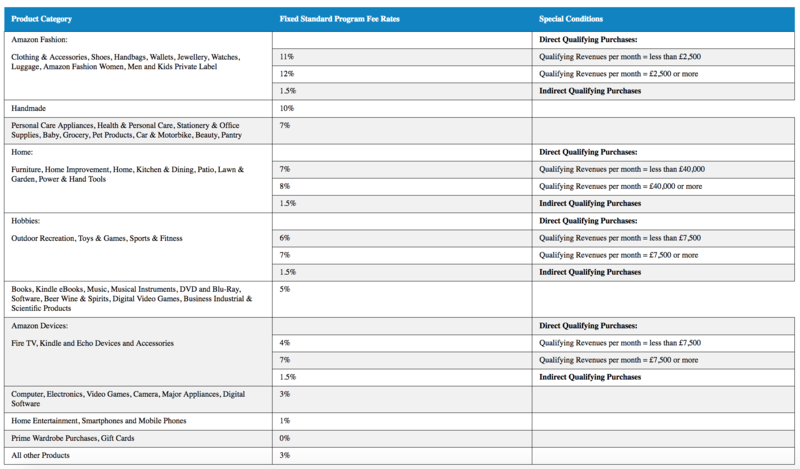 How can I understand what portion of sales are classified as Direct Qualifying Purchases? You can check the Earnings report in the Reports section of Associates Central to understand the portion of your traffic that lead to targeted, “Direct Qualifying”, purchases. From 1 March, the numbers within the brackets, as shown below, indicate the volume of Direct Qualifying Revenue that you are generating. 9. How do I understand how close I am to reaching the revenue tiers in the product categories that offer increased rates for higher volumes of sales? From 1 March, in the Earnings report in the Reports section of Associates Central, when you group by “Category”, you will find a note that specifies how much revenue you are driving in the product categories that offer rate increases for volume. Please see examples below for desktop and mobile. * 10. I am a participant in the Amazon Influencer Program, what do my fees look like? As a participant in the UK Amazon Influencer Programme, please refer to the Fee Statement page here.